With the nation's religion scribes gathered in Minneapolis for their annual conference this weekend, before anything else, a big "heya" to all the colleagues and friends celebrating the 60th anniversary of the Religion Newswriters Association. How I wish I could be there again... if only the budget allowed it. And by no means is that reality unique to this outlet. Faced with declining circulations driven by the rise of the internet and massive deficits due to the collapse of advertising, most of print journalism these days finds itself in critical condition. Across the country, papers have gone bankrupt where they haven't folded outright, and week after week, newsrooms -- and the readers who rely on 'em -- bleed irreplaceable expertise and institutional memory as wave upon wave of buyouts and cuts slash everything from staff and news-space to even the frequency of editions. Beyond their skill at the craft, behind the scenes the RNA crowd is very much a family, and conference weekend always has the feel of a clan reunion. These days, though, it doesn't take much catching up with the rest to realize that the number of full-time faith scribes is dwindling across the map... and, with it, so goes coverage that isn't either scandal-driven or rife with the errors of context and analysis that come with putting a story in less-than-expert hands. When I first started covering religion for the Globe, nearly a decade ago, the beat was almost trendy – newspapers were beefing up their coverage considerably, religion sections were fat, and a few newspapers, like the LA Times, had four or more religion writers. No more. Just this week, as I was preparing to depart for Minnesota, my colleague Gary Stern, who has been a model of how to successfully juggle religion writing for a newspaper and a blog simultaneously, announced that his employer, the Journal News (of Westchester County, New York) had decided it was no longer going to have a full-time religion writer. Gary is fortunate – he gets to keep a job – and he says he’s going to try to continue posting periodically about religion – but clearly the beat is diminished there. This comes on the heels of a decision by the San Francisco Chronicle to stop covering religion full-time – Matthai Kuruvila is now covering the East Bay – and, most shockingly, the decision by the Dallas Morning News, which for years had an award-winning religion section, to kill the free-standing section and reassign the writers to suburban education and other beats. 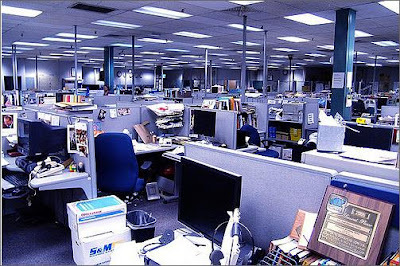 There have been reductions in the number of reporters who write about religion full-time at all of the nation’s biggest newspapers --- the New York Times, the Washington Post, the LA Times (and even at the Globe, where for a brief period we had two religion writers) – and the religion news beat has disappeared from the Cleveland Plain Dealer, the Orlando Sentinel, the Palm Beach Post, the Grand Rapids Press, the Chicago Sun-Times, the San Diego Union-Tribune, the St. Paul Pioneer Press, and Newsday, according to Debra Mason, the executive director of the Religion Newswriters Association. The surviving newspaper religion sections are getting smaller. And at many small and mid-sized newspapers, reporters now juggle coverage of religion with other, often unrelated, subjects, and religion often gets short shrift. Mason told me she does not believe that the religion beat is being targeted, but that all specialty beats at newspapers, including the environment, health and education, are suffering as newspapers, with shrinking budgets, allocate an increasing fraction of their diminished newsroom staffs to general assignment jobs. Along the way, Paulson adds that the number of RNA members working in print declined by almost a fifth -- from 232 to 197 -- over the last year alone. Suffice it to say, we all owe a debt of thanks to the tremendous folks who work the secular religion beat, and the outlets that've kept enough faith in it to keep it alive. Most of us owe it as consumers of content that's balanced, knowledgeable, not sensationalized and rich in context. Closer to home, though, this scribe owes it even more for all the support, friendship, encouragement -- and, especially, the pointers -- they've given me along the way, which hopefully some here have benefited from by extension over time. See, I learned the ropes in the big-city newsroom. It's where I fell in love with the news, and in terms of the work, it's the place I still feel most at home. Over the years, some have been so kind to see these pages as part of the "next generation" of the beat. That's pretty humbling, but whatever I know, I owe to to the pros. And nearly 11 million readers later, the work continues. It's rarely easy, but always a joy and a gift to do... and to everyone who keeps making it possible, all the thanks in the world... ten million times over and then some. While we're at it, it's one of those realities of life that effective communication in the church is something one sometimes finds honored in the breach as much as the observance. That isn't to say it doesn't get done right and well -- surely it does, and in spades. As with everything else, though, all it takes is one misstep -- or, worse still, just one miserable messenger -- to mar a flotilla's worth of incredible witness and work. The volatile state of the religion press provides the church a host of opportunities and challenges alike when it comes to communication. Yet regardless of the backdrop, what always matters most is neither the medium, nor any other external aspect, but the message itself. Lack that, and all the Twittering, tagging, Facebook and Flash under the sun won't accomplish a thing. In that light, a noteworthy set of tips emerged earlier this week from an unexpected source -- the president of the CELAM (the Latin American mega-conference of bishops), Archbishop Raymundo Damasceno of Aparecida. 1. Overcome the idea that the means of communications are themselves communication. In other words, building TV networks, radio stations, and web sites is all well and good, but if you don’t have something compelling to say, building new and better ways to say it won’t accomplish much. 2. Stop thinking that modern means of communication are “secular.” (Damasceno actually used the term “profane,” but he meant it in the literal sense of being outside the temple.) In other words, TV, the Internet, etc., are not somehow alien to the church. Instead, Damasceno said, quoting the Colombian journalist [who offered the pointers], they are neutral, and everything depends on how they’re used. 3. Understand that communications and preaching are not the same thing. Preaching is one form of communication, but there also has to be space for providing basic information and responding to questions in a fashion distinct from catechesis or moral exhortation. 4. Understand that every pastoral act is a form of communication. The church is always communicating something about itself to the outside world, even at the level of how people are treated when they have contact with the church. 5. Accept that effective communication happens between equals. Just as Christ emptied himself to become human, Damasceno said, the church must not presume an attitude of superiority when it’s trying to communicate with the world. 6. Realize that communications is not the same thing as PR. Ultimately, Damasceno said, the point is not just to project a better image of the church, but rather to share something of Christian life and to help people see their lives and the world from within a Christian frame of reference. ...and regardless of what we do or where we're at, church, that last one's what it's all about.